Simply trying to cover more ground with each step is not the way to go. If you're a runner, it's a solid bet that you're interested in ways to get faster. Chances are also good that you know that you need to increase stride rate, stride length or both in order to bump up your pace. So, say you want to focus on stride length. Other than start consciously and awkwardly lunging toward glory, what do you do? A lot of experienced coaches suggest one or more forms of resistance training. Many newer distance runners have the idea that proper form means taking long, loping gazelle-like strides. This a curious phenomenon given that the runners in the lead pack of any major race are clearly clipping along with a high turnover rate and a modest stride length in relation to their speed. Nevertheless, the idea persists, and it's a dangerous one because trying to cover more ground with each step in an unnatural way can not only slow you down, but bring about biomechanical problems that can lead to injuries. 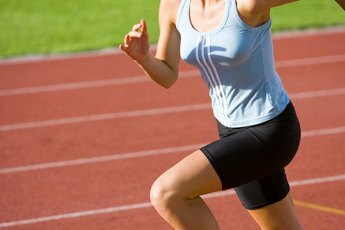 Brian Mackenzie, a longtime coach with UK Athletics, notes that any strengthening exercise aimed at improving running speed must mimic running itself as closely as possible. He recommends an eight-week schedule incorporating three key power-developing exercises: the high bench step-up, the one-leg squat and the one-leg hop in place. Over the course of the eight weeks, you roughly triple the number of repetitions of each exercise you perform per session, from two or three sets of 10 to 15 to two or three sets of 25 to 30, in some cases incorporating added weight. If you do these properly, you should see gains in both stride length and stride rate, he says, and offers specifics on how to perform the exercises on his site. You may have been treated to the sight of a runner sprinting madly against the resistance of a parachute, resistance band or some other device aimed at turning her into a beast of burden of sorts. Is there any evidence that these near-torture devices are effective? It appears that there is. A University of Athens study published in "Biology of Exercise" in 2011 looked at the effect on stride length of eight runners attached to parachutes compared to eight matched controls. 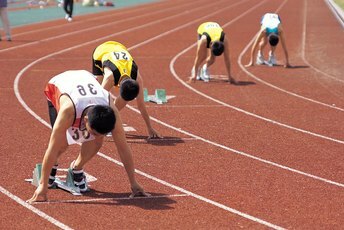 They found that the sprinters in the parachute group significantly increased their velocity during the acceleration phase of their runs, and furthermore that it increased stride rate at top velocity. 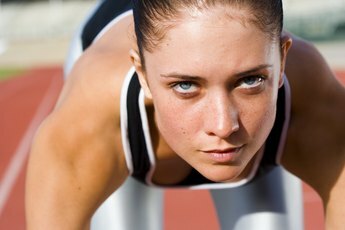 Certified personal trainer Bob Townsend says that standard endurance training combined with plyometric strength training can optimize running economy, and therefore maximize speed. Because plyometrics, done properly, increases both the rate at which muscle cells contract and the force with which they contract, the result is an increase in power and strength. He points out that lengthening the stride by only one inch in effect shortens a 26.2-mile marathon by about one kilometer, or 0.62 miles. This translates into about three to six minutes of improvement, all else being equal. DrMirkin.com: Running Faster: Increase Stride Length or Frequency?